(Editor’s Note: Franklin “Chuck” Spinney is the epitome of a principled, outspoken Washington whistleblower. For 30 years, working within the Pentagon, he analyzed the cost and effectiveness of America’s weapons, boldly speaking out against “the military-industrial-congressional complex” and the billions of dollars wasted on weapons systems that simply didn’t work. He was a perpetual thorn in the side of the defense lobby and a good thing, too; his work spotlighted in a 2003 Emmy Award-winning edition of NOW with Bill Moyers. This post orginally appeared at The Blaster. The nuclear question is becoming increasingly obfuscated by spin and lobbying as the West sleepwalks into Cold War II — a walk made all the more dangerous when the loose lips of the US tweeter-in-chief announced that another nuclear arms race is a great idea (see link, link, link). Two Cold War II issues are central and almost never addressed: What will be the Russians’ understanding of all the propaganda surrounding the nuclear question and the looming American defense spend-up? And how might they act on this understanding? To put an end to Cold War thinking, we will reduce the role of nuclear weapons in our national security strategy, and urge others to do the same. Make no mistake: As long as these weapons exist, the United States will maintain a safe, secure and effective arsenal to deter any adversary, and guarantee that defense to our allies — including the Czech Republic. Viewed in retrospect, it is clear that the new president — either naively or cynically — acquiesced to that senatorial spending demand in order to keep the powerful nuclear laboratories and their allies in the defense industry and Congress from lobbying against his new arms limitation treaty. In April 2009 Obama took the first steps that launched a huge spending plan to modernize US nuclear forces across the board. Eight years later, during his first call to President Putin on Jan. 28, 2017, President Trump locked that program in place by denouncing Obama’s New START as a “bad deal,” saying it favored Russia. Early cost estimates — really guesses — for Obama’s entire nuclear modernization program are for $1 trillion over the next 30 years. No missile defense costs are included in this estimate — nor are the costs of Trump’s promised expansions. The components of the currently authorized program — e.g., a new bomber, a new ballistic missile carrying submarine, a new ICBM, a new air-launched cruise missile, a complete remanufacturing upgrade of the existing B-61 dial-a-yield tactical nuclear bomb that also adds a precision guidance kit, a new family of missile warheads, new nuclear warhead production facilities and a massive array of new large-scale intelligence, surveillance, command and control systems to manage these forces — are all in the early stages of development. Assuming business as usual continues in the Pentagon, the $1 trillion estimate is really a typical front-loaded or “buy-in” estimate intended to stick the camel’s nose in the acquisition tent by deliberately understating future costs while over-promising future benefits. As the torrent of money builds up over the next decade, the flood of subcontracting money and jobs in hundreds of congressional districts guarantees the entire nuclear spend-up will acquire a political life of its own — and the taxpayer will be burdened with yet another unstoppable behemoth. The money for all of these programs is just beginning to flow into hundreds of congressional districts. As the torrent of money builds up over the next decade, the flood of subcontracting money and jobs in hundreds of congressional districts guarantees the entire nuclear spend-up will acquire a political life of its own — and the taxpayer will be burdened with yet another unstoppable behemoth. Locking hundreds of congressmen and senators into this nuclear modernization program guarantees that the money flow and cost overruns will increase without interference for the next 30 to 50 years. Our many years of observing and analyzing DoD’s largest politically engineered acquisitions makes it obvious that the initial buy-in guess of a trillion-dollar total will turn into at least a $3 trillion price tag by the end of three decades. In short, the Pentagon is planting the seed money for another F-35-like disaster, only this time on steroids. But there is more. Once this multitrillion-dollar, self-sustaining money gusher is sluicing steadily into the boiler rooms of the MICC, US force deployments, alliances, treaties and threat assessments will be shaped even more heavily than now to support the domestic politics of ever-increasing spending for it. Despite this, our nation’s foreign policy mandarins seeking to steer the ship of state from their perch on Mount Olympus will remain oblivious to the fact that their “policy” steering wheel is not connected to the ship’s rudder. As of now, no one in the MICC really gives a damn how the Russians (or the Chinese) might actually react to America’s looming nuclear (and non-nuclear) spending binge. This is clearly seen in the cognitive dissonance of the Obama Defense Department: It was torn between insisting the Russians are not the target of the nuclear program but at the same time justifying the nuclear build up as a means to counter Russian conventional aggression. Equally revealing, a Feb. 8 editorial in the Pentagon’s favored house organ, Defense News, described President Trump’s upcoming Nuclear Posture Review without once mentioning the Russians or Chinese nor how they might react to the looming American spending spree. On the other hand, the editorial took great pains to explain in detail how the forces of domestic political consensus will ensure steady funding for Obama’s nuclear spending plans throughout the Trump administration years. Lets try to look at the nuclear modernization program — and the looming defense spend-up — from the Russian leadership’s point of view. The Russians, particularly those internal political and industrial factions that benefit from Russian defense spending, are very likely to characterize the American spending program as an aggressive sharpening of the US nuclear sword and a strengthening of its nuclear shield, synchronized with a threatening buildup of America’s conventional force. And that will be used to argue that Russia is spending far too little on defense because it faces an existential threat due to increased American spending. Mirror imaging Reagan’s argument, Russian defense advocates emphasizing the dangers of the US spend-up are likely to point out that the United States and its allies are already spending far more on their military forces than Russia is spending. Moreover, America certainly intends to rapidly increase the size of this spending advantage, because the large new American nuclear modernization program is only part of a yet-larger long term spending buildup. After all, have not President Trump and Sen. John McCain (R-AZ) proposed huge increases to President Obama’s defense budget to rebuild what Trump and McCain claim is a “depleted” military (see link 1 and link 2 respectively)? Advocates of increased Russian defense budgets might also ask, are not Trump and McCain declaring an emergency by calling on Congress to exempt defense spending from the spending restrictions imposed by the Budget Control Act of 2011? 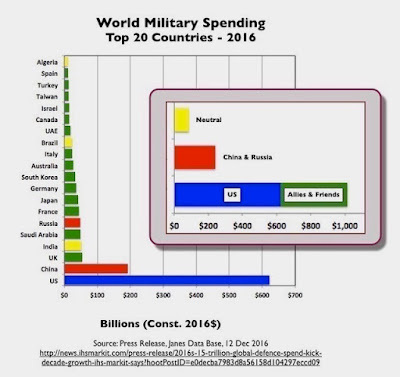 Add to the US defense budget the contributions of its allies and close friends and the spending balance in favor the US and its allies to that of Russia alone becomes an astounding 21 to 1! Even if Russia could trust China to be a reliable ally — which it can’t — the current spending imbalance is over four to one in favor of the US and its allies on the one hand and Russia and China on the other. 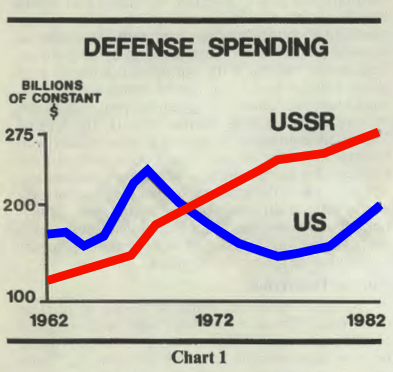 Advocates of increased Russian defense spending might even argue their comparison does not suffer from the gross distortions created by Reagan’searlier chart because (1) the Ruble was not convertible into dollars in 1982 (whereas it is today), and Reagan’s comparison severely overstated Soviet spending levels using an artificial exchange rate; and (2) the dollar numbers in their Chart 2 comparison start from zero, unlike the deliberately truncated dollar scale (100 to 275) Reagan used in Chart 1 to exaggerate his point. They might see the Trumpian expansion of both nuclear offense and missile defense as evidence the US is planning to dominate Russia by preparing to fight and win a nuclear war — a radical shift from America’s 50+ years of building nuclear forces only for deterrence (often referred to as Mutually Assured Destruction or MAD). That principle will dictate a response, presumably a massive Russian nuclear arms race with the United States. The obvious fact that the politically engineered US nuclear program cannot be reined in or terminated by politicians in the US is almost certainly understood by the Russians. But that appreciation would serve merely to magnify the sense of menace perceived by patriotic Russian leaders. Clinton announced support for NATO expansion in October of 1996, just before the November election, to garner conservative and hawk votes, the votes of Americans of Eastern European descent and in response to an intense NATO expansion lobbying campaign mounted by the MICC — and to steal the issue from his conservative opponent Senator Robert Dole. The expansion of NATO eastwards combined with President Bush’s unilateral withdrawal from the Anti-Ballistic Missile Treaty in June 2002, followed by the deployment of ABM systems to Eastern Europe certainly increased the Russians’ sense of mistrust and menace regarding US intentions. To this day, Putin’s speeches repeatedly refer to the broken American promises. The people in Russia who believed in shock therapy were Bolsheviks — a few people at the top that rammed it down everybody’s throat. They viewed the democratic process as a real impediment to reform. And in a touch of irony, given the current hysteria over President Putin’s alleged meddling in the US presidential election, it gets worse. 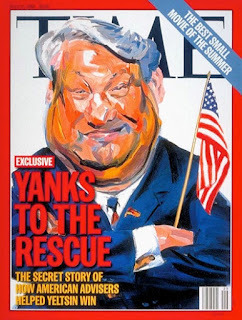 Russian leaders are also unlikely to forget American intervention on behalf of Boris Yeltsin in the Russian elections of 1996, including using American control of the International Monetary Fund to float a $10.2 billion loan in March to 1996 to help the corrupt and malleable Boris Yeltsin to win the election in June. So, from a Russian perspective, the recent increasingly severe US sanctions are not only hypocritical, they certainly reinforce the view that the US-led campaign to cripple the Russian economy is ongoing and perhaps endless. Moreover, the rapid, opportunistic expansion of NATO and the EU created a kaleidoscope of internal frictions. Now both institutions are in trouble, riven by contradictions and disharmonies. Great Britain is leaving the EU but will remain in NATO. Northern Europe and the EU bankers are imposing draconian austerity measures on Southern Europe, particularly Greece. Turkey, long a key NATO ally, is turning to Russia while being rejected by the EU. The destruction of Libya, Iraq and Syria, under US leadership with European participation, has created an unprecedented flood of refugees into the EU, deeply threatening the EU’s organizing principle of open borders. The increasing tide of European instability and chaos, accompanied by the looming specter of growing Fascist movements from Spain to Ukraine, inevitably add to the traditional Russian sense of being endangered and encircled. Russian leaders cannot ignore the fact that Kaczynski called for a nuclear EU shortly after the US 3rd Armored Brigade Combat Team of the 4th Infantry Division (3,500 troops and 2,500 vehicles) deployed to Poland. Even worse, the commanding officer promptly declared the brigade is “ready to fight,” though it is intended to “deter” any threat to Poland. One brigade is a trip wire … or a kind of blank check that might be exploited for nutty reasons to trigger a shooting war — and as Kaczynski just demonstrated, nuttiness is afoot in that part of the world. Franklin "Chuck" Spinney retired from the Defense Department in 2003 after a military-civilian career spanning 33 years. The latter 26 of those years were as a staff analyst in the Office of the Secretary of Defense. During this period, he appeared as a witness in many congressional hearings before the Budget, Armed Services, Defense Appropriations and Government Affairs or Reform and Oversight committees of the US House and Senate. He is author of Defense Facts of Life: The Plans/Reality Mismatch (1985). His op-eds and essays have appeared in the The Wall Street Journal, The Washington Post, Los Angeles Times, Challenge, CounterPunch, Proceedings Magazine of the US Naval Institute and the Marine Corps Gazette, among other places. His critical plans/reality analysis of the Reagan defense program landed him on the cover of TIME magazine (March 7, 1983). In 2003, his hour-long "exit interview" with Bill Moyers on the PBS show NOW won an Emmy Award for best news magazine show of 2003. Many of Chuck’s reports and essays can be found on his website. Follow him on Twitter: @ChuckSpinney. Pierre Sprey was one of the early whiz kids in the Office of the Secretary of Defense (OSD) in the 1960s. He led the Air Force's concept design team for the A-10 attack aircraft and, together with Cols. Boyd and Riccioni, fathered the F-16 fighter. Spinney has testified before Congress on many occasions and was a founding member of the Military Reform Movement led by Col. John Boyd.